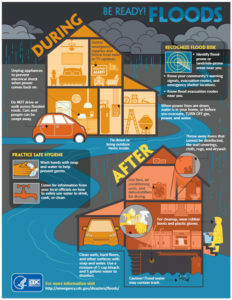 Floods are unpredictable and destructive. They affect millions of people each year and cause property damage in the billions of dollars. Rain, day after day, for a prolonged period; fierce, driving downpours for a comparatively brief period; melting snow accumulating faster than the ground can absorb it; streams backed up due to ice or debris; clogged drainage systems; or the failure of a levee or dike—any one of those circumstances can endanger you, your loved ones, and your property. 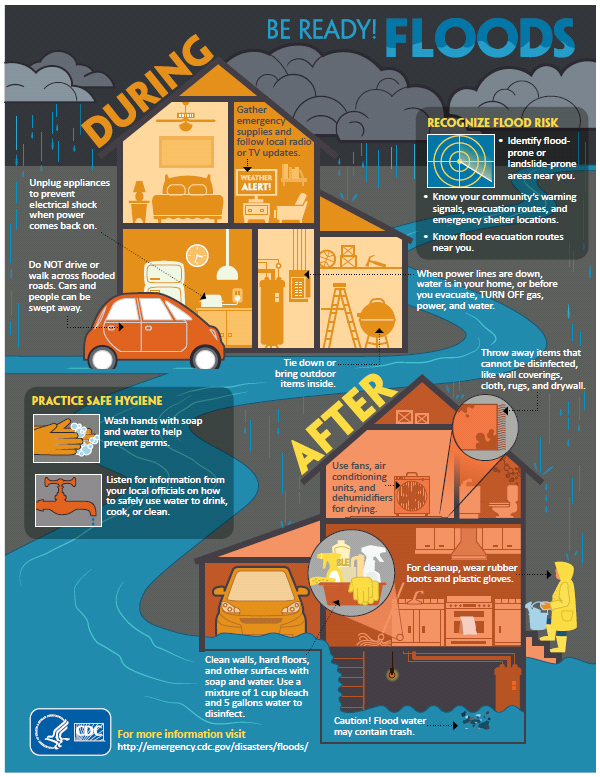 Flood waters can rise 10 to 20 feet and can be filled with debris, as well as contaminants that can be the source of serious infections. The most obvious danger is that of drowning. Injuries result from slipping or tripping on the hazards obscured by the water, e.g., uncovered manholes, curbs, and branches. Power lines on the ground could be live. A flood can severely damage the exterior and interior of your home, its contents, and its mechanical and electrical systems. Don’t feel helpless against this force of nature. Be prepared for a flood. Don’t wait until the water is lapping against your door. If you are prepared, you’ll be able to respond promptly and reduce the risk of danger and damage. When the flood is over, tread carefully as you start the recovery process. The threat of danger is elevated when it’s time to clean up. Know the safest routes to shelter. In many states, you can get a flood evacuation map at the Office of Emergency Management or Department of Public Safety. If not, contact the American Red Cross. Become familiar with the map. Do practice runs. You don’t want to be unsure of the route(s) when there is a state of emergency. Have a plan for where you will go for shelter—have a few places in mind, in case some roads are impassable. Know how to turn off electricity, gas, and water to your house. Check your smoke and carbon monoxide detectors regularly. That’s important even on the most ordinary of days, but after a flood, they will alert you to fire and gas leaks when you return home. When a flood is imminent, listen to a radio for updates and advisories. If instructed, turn off all utilities at the main switch and close the main gas valve (because you already know how to do that, right?) Note: Only a professional can turn the gas back on. If you are told to evacuate immediately, grab your emergency supplies and leave. The longer you wait, the heavier the traffic and the more hazardous the road and weather conditions. Roll up rugs and move furniture, electrical items and valuables to a higher level. If you do not already have them packed, put warm clothing, essential medication, valuables, and personal papers in waterproof bags. Do not walk through floodwaters. Swiftly moving water even six inches deep can sweep you off your feet. Keep a careful watch for hazards such as raised drain covers, open manholes, curbs—anything that you may trip or slip on. Be especially cautious at night when it is harder to see the dangers. Explain to the children that this is not a fun time to play in the water. If you are caught on a flooded road and can see the ground, get out of the car and move to higher ground. If you cannot see the ground, stay in the car and call for help. Monitor your local radio for warnings and advice. Move vehicles, outdoor equipment, garbage, and harmful chemicals to higher locations. Fill bathtubs, sinks, and jugs with clean water in case the tap water becomes contaminated. Raise furniture above likely flood levels. Go to the highest floor in your home. Keep your emergency supplies handy. You’ll be relieved when you see the waters begin to recede. The authorities have declared your area safe. Now the real work begins. More flood accidents and injuries occur during the clean-up operation. Please review the following guidelines and warnings. Wear sturdy shoes and work gloves and have a battery-operated flashlight and a long stick to check the depth of the water. Do not enter if the flood waters around your home have not subsided. Do not enter if power lines are down outside your home, and do not step in puddles or standing water. Do not enter if there are damaged gas lines, foundation cracks, or structural damage. Approach the door carefully. Make sure porch roofs and overhangs are in tact. Outside your home and inside, watch for wild animals, particularly poisonous snakes, who have come there for sanctuary. Use your long stick to poke through debris to rout them out. If your smoke and carbon monoxide detectors are beeping or if you smell natural or propane gas or hear a hissing sound, open a window and leave immediately. Turn off the gas at the main valve if you can. Call the gas company and the fire department. Look for fire hazards: broken or leaking gas lines, flooded electrical circuits, submerged furnaces or electrical appliances, or any flammable or explosive materials among the debris. Check for damage to your sewage and water lines. If sewage lines appear to be damaged, do not use the toilets and call a plumber. If water pipes are damaged, contact the water company and do not drink the tap water. Examine the walls, ceilings, floors, doors, and windows to make sure that they are not in danger of collapsing. Discard items that have been contaminated with flood waters and cannot be disinfected (such as, mattresses, carpet and padding, upholstered furniture, cosmetics, stuffed animals, baby toys, pillows, foam-rubber items, books, wall coverings, and most paper products). Throw away food and bottled water, including canned goods, that have come in contact with flood waters. Do not drink tap or well water until it has been declared safe. Until then, boil your water. Thoroughly clean all hard surfaces (such as flooring, concrete, molding, wood and metal furniture, counter tops, appliances, sinks, and other plumbing fixtures) with hot water and laundry or dish detergent. In the kitchen, cupboards, counters, and dishes need to be cleaned with a solution of 2 tablespoons of chlorine bleach per gallon of hot water. Boil metal pots and utensils. Chlorine may cause metals to darken. Photographs, books and important papers can be frozen and cleaned later. Put them in plastic bags and store in a freezer to protect them from further damage. As you clean, list the damages and photograph or film them for your insurance claims, disaster assistance or income tax deductions. When the flood and its consequences have passed, examine your preparations, responses, and the measures you took in the recovery process. Be thorough and objective. We’ve given you guidelines and warnings. Use the actual experience of a flood to learn what can be improved upon in your unique circumstances for greater safety and efficiency. Make a log of the revised actions and be sure all family members are familiar with them should another flood occur with little or no warning. And, of course, replenish your emergency supplies.